Eating out is often villain-ized among the healthy-eating crowd, myself included, for offering excessively large, unhealthy portions, lower quality ingredients and generic tasting entrees targeted to the masses. What can’t 4 lbs. of cheap bacon and melted cheese make taste good? But, I’m actually a huge fan of eating out at places offering more unique dishes creating new flavor adventures, better ingredients and, of course, good vegan options. You’d think decent vegan options would be easy to find in California, but that’s not the case at many family-style chains. One point made in the movie Food, Inc. that really hit home with me is every food purchase we make is a vote for it, it sends a message to the food industry that that’s what consumers want more of. So when decent local and chain places offer healthier, vegan options, I try to support them, or vote for them, when I can. Plus I enjoy the originality in these food creations. Since cutting out meat and trying more vegan and vegetarian options while eating out, I’ve been exposed to some wonderful new flavors that I would never have been ordering another salmon fillet or chicken salad. Such dishes like an amazing mushroom burger utilizing local mushrooms at Paul Martin’s American Bistro and grilled portobello risotto at Crush 29. Another place we’ve been to a couple of times now is The Counter, a popular California burger chain. It’s one of the few places were hubby can get a burger his way and I can create a customized vegan masterpiece of a veggie patty over greens of my choice and accessorize with any dressing. Filling out their Build Your Own Burger sheet can feel a bit like high school scan tron test and can end an odd flavor combination if you’re not careful. But they also have some good veggie combos on the menu for easier ordering, like the Asian Veggie combo. 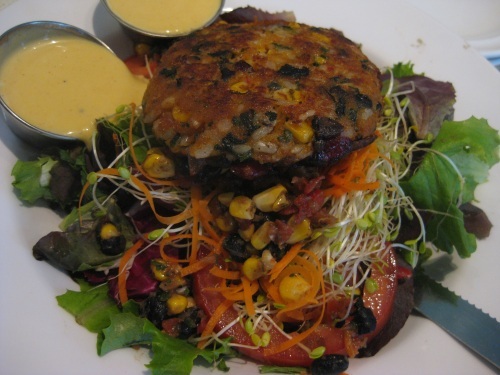 The housemade veggie patty is wonderful loaded with corn, beans and rice while being the lowest calorie option on the menu. Unfortunately, the veggie patty is not gluten-free for those with allergies or avoiding gluten in general. I hope they add a GF option soon. Still, The Counter is a solid option for vegans and their not-so-vegan dates. The weather here is shifting into winter and this week has been a lot more cold and wet. After a day of running around in chilling wind and rain, I have to admit a raw dinner was the last thing I was craving when I got home. I pulled some very un-raw ingredients I picked up at Whole Foods for vegan spaghetti. WildWood High-Protein Super Firm Tofu loaf is one of my favorite vegan go-to comfort foods because it’s a great source of protein that’s fast to prepare, does not require pressing and at $3.79 for a huge, 10-serving loaf from Whole Foods, it makes a whole lot of fast meals for cheap. Granted, I’m trying to cut my overall tofu intake, but this is great for occasional comfort recipes. Another WildWood guilty pleasure are PastaSlim noodles, I just couldn’t resist when Whole Foods had them on sale for $1 each. 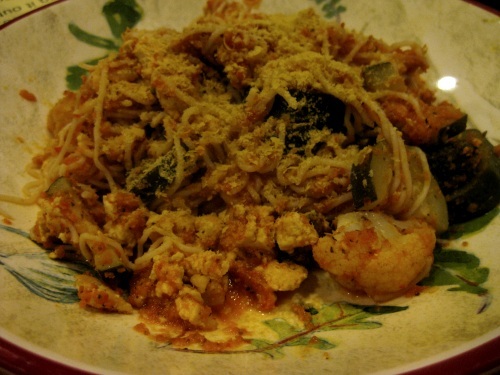 Traditional pasta has over 200 calories per serving, these have only 20 calories! And they’re gluten free. 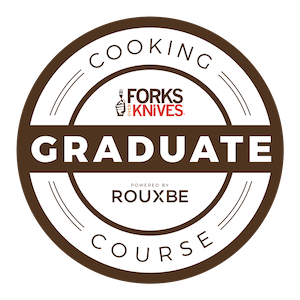 Oh, and much easier to prepare, just strain, rinse and heat – no water boiling. They don’t have too much flavor, but neither does plain pasta, and they seem to work well with many flavors. 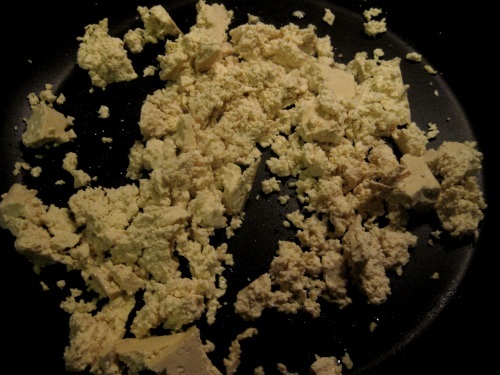 To start, I heated a couple of tablespoons of garlic olive oil then crumpled the tofu into the skillet to heat it up. 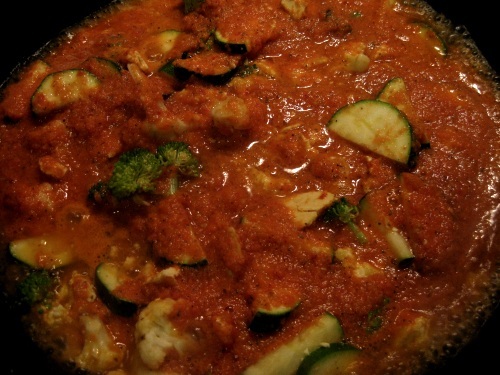 Then I added chopped broccoli, cauliflower and zucchini to the skillet and poured the marinara sauce over it. 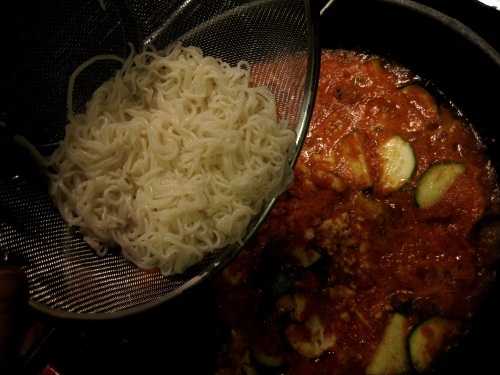 Then added the rinsed PastaSlim noodles and simmered the mess together covered for 10 minutes over medium heat. I just topped it with nutritional yeast here, but you could add vegan mozzarella shreds, hemp-asan, or nothing. 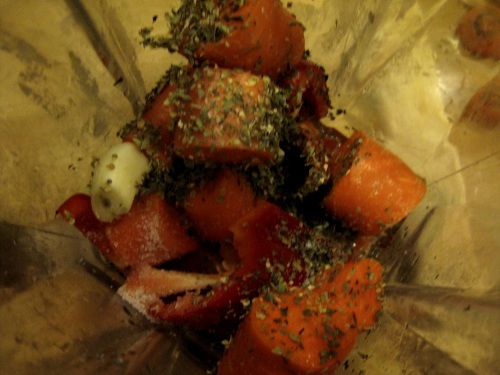 It made a great, quick dinner without overcooking the veggies. 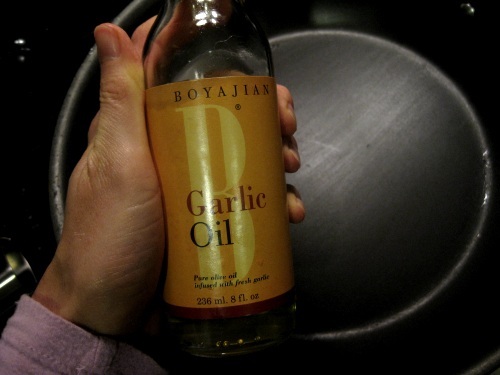 Thanks, I’ve been adding nooch to a lot	of dishes lately and it’s awesome on salads or in raw “cheese” sauces. 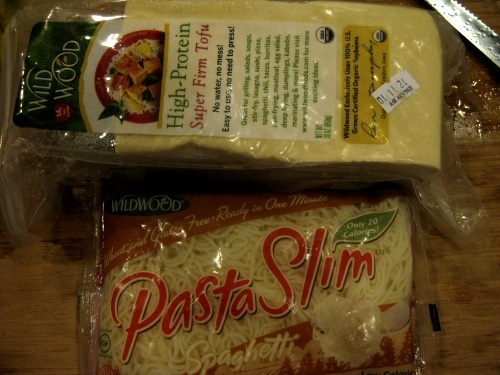 I’ve never seen that pasta slim– what a great product! They’re located with the tofu and tempeh in Whole Foods and most regular grocery stores have them in the “health foods” section. 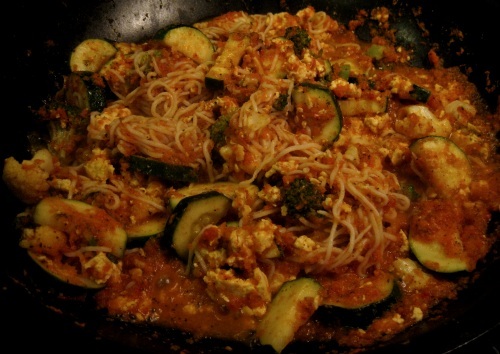 Are those Pasta Slim noodles anything like those Tofu Shirataki noodles? I love kelp noodles, but I think the shirataki ones are kind of gross. And nutritional yeast makes ANYTHING taste better. I love adding it to tomato soup! Yeah, the PastaSlim noodles are similar to the Tofu Shirataki noodles, but the texture is a little lighter and they seems to absorb sauce flavors better. The Shirataki noodles seem more rubbery to me and have an almost fishy smell when the package is first opened.